The past couple of weeks have challenged me not in the running, but more in actually getting out and doing the training. As the mileage builds to over 55 miles per week the willingness to get out of bed and run those miles has dropped. It’s been cold, it’s been windy and it’s been wet. That’s not really conducive to getting up at 6am to run. And as the distances grow it’s starting to feel rather isolating. Running longer distances at the weekend currently takes up half a day by the time I’ve gotten up, run the 2 or 3 required hours, warmed down and iced etc. I’m going out around 8am or 8.30 in the mornings but after the post run routine and then shower it’s already lunchtime. Then I have to get the usual household chores done, weekly supermarket shop (I don’t like doing grocery shopping online – I want to select my own apples!!! ), squeeze in an essential agonising sports massage etc before I get a chance to sit down. You absolutely can’t sit down beforehand otherwise you won’t get back up again, instead sinking into the sofa for an afternoon nap if the noisy neighbours downstairs permit! By the time all that’s done you don’t want to do anything else. Even cooking dinner is an effort and don’t even think about making plans to see friends in the evening. You just won’t have the energy – all you want to do is chill on the sofa until you can drag yourself to bed. And then, because you’re training for multiple marathons across 3 days, you get to get do it again on the Sunday before going back to work on the Monday. That pretty much sums up my weekends now. Woe is me! To have a run when it’s not raining is a bonus – the past couple of weeks have been a good opportunity to test out the wet weather gear. The good news is that my jacket is amazing at keeping the rain out. It’s equally good at keeping the sweat in, so at the end of the run you’re wet and cold anyway! My running gloves are lovely but as I have such bad circulation in my hands they still go numb and take an hour to recover once I’m back home. The defrost process can be quite painful so I’m going to have to think about another layer of Thinsulate gloves on top on particularly cold days – brrrrr! Getting up at 5.30am on a Sunday morning the other week to get 15 miles of hills done before the rain and snow hit was the deciding moment on this. Not being able to feel your hands at 6 miles, with 9 still go isn’t the best feeling in the world! So yes, it’s been hard, but let’s face it, I knew it would be like this when I signed up. If it were easy everyone would be doing it wouldn’t they? It’s not called a challenge for no reason. It’s an endurance event, and the endurance is in the training as well as the event itself so this period is an essential part of that training. Whilst I’ve been feeling a bit down in the dumps, I’m actually seeing the positives. 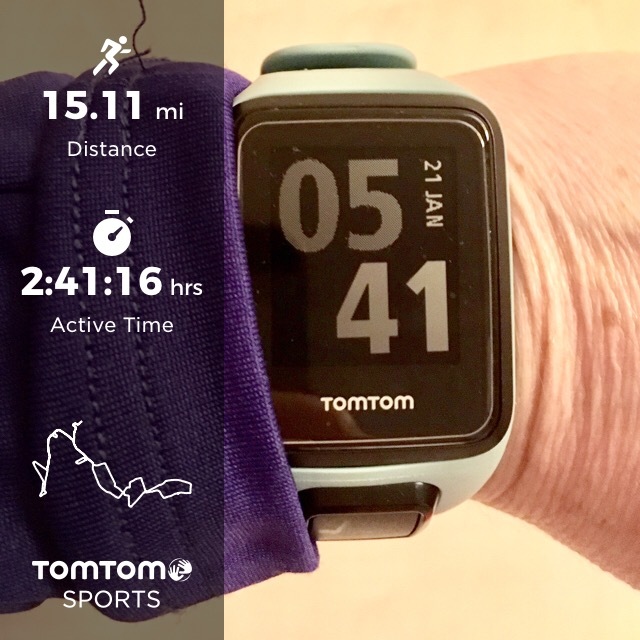 I’ve got more miles on the clock (560 to be precise up to the end of week 13), I’m over the halfway mark, I’m improving each week, and I’ve not yet missed a training run from the plan. The body is holding out so far (I don’t want to jinx it! ), so I just need to keep the focus up, do what the plan tells me to do and remember that this is only temporary, with each run getting me closer to the end goal. Just under two months left. Time to dig deep!